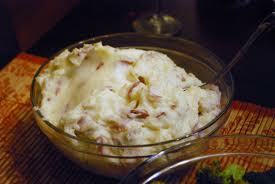 Today at work, had a customer asking about how to make mashed potatoes. These were the potatoes we served at the restaurant where I was GM. Quarter the potatoes and place in a large pot with salted water and bring to a boil. Boil for about 25 minutes or until fork tender. Drain the potatoes and dry on a sheet pan in a 350 F oven for about 10 minutes to remove any moisture from water. Return the potatoes to the pot they were boiled in and place over low heat. Begin to mash the potatoes and add the butter, and then the cream little by little until you reach the desired consistency you wish to have. Fold in the Green Onion and sauteed Garlic if desired. Serve or hold hot until ready for service. Prepare ahead: You can prepare the day ahead and reheat slowly over low heat adding whole milk or more cream slowly to keep them from being too firm and stiff. Variations: You can add, cream cheese instead of sour cream or grated parmesan cheese when finishing by folding in, even a sharp cheddar could be used.